I love the change of direction that S.W. 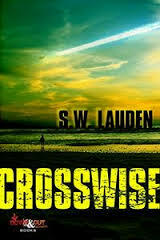 Lauden takes with his new book,Crosswise. Not because I didn’t love Bad Citizen Corporation, on the contrary, I love this change due to how much I loved his first book. Lauden is showing that he is adequately capable to dabble in a wide-range of genres. He seems destined to be an author that will defy being labeled as a writer from any specific genre. Lauden starts this recipe with a disgraced cop who stole cocaine from an evidence locker to support the habit of his girlfriend and now he is forced to work as the head of security at a Floridian old folks home. He then he mixes in mafia connected old timers, murder, angry policemen, and someone who is serving up clues in a radical manner. Lauden bakes it at a high heat and serves it with a deft touch that propels the reader on one hell of a ride from the get-go until the final page. While this is a great read, the true beauty of this gem is seeing Lauden flex his muscles in a very different story than his first offering. Lauden has stated that readers will see him delve into many different styles and genres, both conventional and unorthodox. If his first two books are any indication, it is a wise choice for you to jump on this bandwagon right now. If this book doesn’t get him the rub right now, I can say he will be labeled a must-read author in the very near future. His writing is a thing of beauty.